Mold can be a messy problem that gets out of hand more quickly than you might think. As a business owner in Lacey, WA you probably already know how essential it is to manage mold growth. A crucial part of mold prevention is knowing the environments it tends to flourish in, then spotting the fungi before it becomes a major problem. Water damage is one of the best catalysts for fungus proliferation. It thrives in warm, moist environments, which can happen in a facility’s bathrooms, leaky pipes, or broken seals. Once the mold is able to gain a foothold, it can spread rapidly — it’s possible to have a serious mold issue on your hands in a matter of days. Fortunately, knowing its patterns is a great step in being able to prevent it. A huge factor in mold prevention is keeping a watchful eye on the places it’s most likely to arise. Some common areas include HVAC systems, ceiling tiles, carpets, and paper. These materials are prone to water damage and, by association, to molding. By staying clued in to anywhere in your commercial property prone to humidity and warm temperatures, you’ll also be clued in to some potentially moldy areas. Unfortunately, finding mold happens more often than business owners would like it to. If your business is in a more humid climate, this is a problem to be especially vigilant about. Once you’ve followed the above steps and spotted a problem, reach out to the mold remediation specialists in Lacey, WA. Don’t attempt to deal with it yourself — it’s tricky and unsafe for non-professionals to handle. Mold can be a messy problem that gets out of hand more quickly than you might think. By following a few mold prevention steps and reaching out when your facility has fungus, you’ll be on the right track to solve this issue. SERVPRO and other companies that are certified must meet a strict set of standards. After a disaster of any kind affects commercial properties in Lacey, WA an insurance agent can help business owners navigate the process of restoration. However, many people are unaware of how a restoration company is chosen. It’s often useful for business owners to understand what agents look for in a restoration company. What Services Restoration Companies Provide? Availability to answer questions in a timely manner. What Qualities Should a Restoration Company Possess? When choosing a company to assist in restoration, agents often choose a business that has been certified by the IIRC. SERVPRO and other companies that are certified must meet a strict set of standards. A certified vendor must train its employees on the best restoration practices, which ensures up-to-date technology and practices will be used throughout the restoration process. Overall, IIRC validation signals to agents, adjusters and business owners that the restoration company is trustworthy and reliable. Though restoration can seem complicated, an insurance agent and an experienced restoration company can make the process simpler. Agents often focus on what services a company provides and what standards a company meets, which often includes IIRC validation. Emergency restoration companies can also help you learn how to prevent leaks and damage in the future. Waking up to unwanted water in your home isn’t the best way to start the day, and when it comes to water damage, time is of the essence. 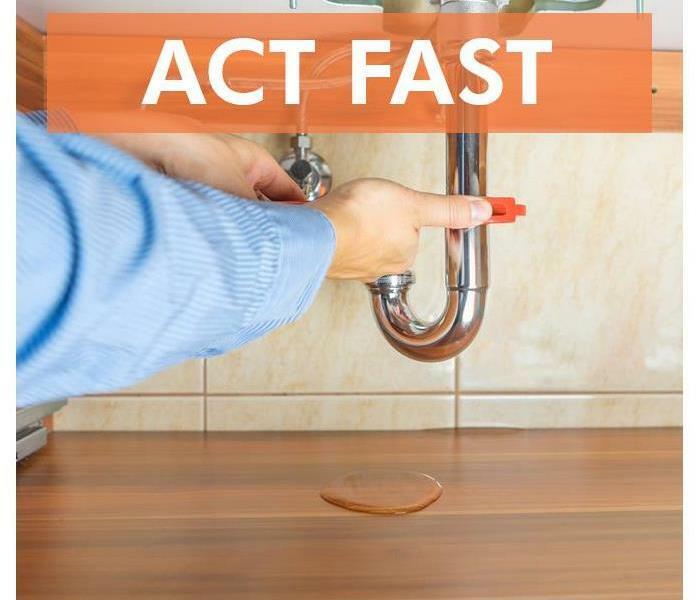 Knowing what to do about a leak before it happens can help minimize the damage caused by flooding and can help ensure your kitchen repair goes much faster. The first step to take after discovering a leak under your kitchen sink is to turn off the main water supply. Even if the faucet itself is not running, water can continue to leak from your pipes, slowly damaging both cabinets and flooring. By turning off the main water supply to the kitchen, there is a higher chance you can keep the damage from getting worse. After shutting off water to the kitchen, the next step is to assess the damage. Since it can be difficult to know the extent of water damage caused by leaks, the best course of action is to contact your insurance company. Insurance companies employ experienced professionals who can determine how much damage has been caused by flooding over time and can help you understand how your insurance benefits can help you offset the cost of your kitchen repair. As soon as the insurance company has been contacted, you should contact an emergency restoration company. Hiring a professional who is experienced in water damage repair in Olympia, WA is the best way to expedite your repair process. Emergency restoration companies can also help you learn how to prevent leaks and damage in the future. By following these three simple steps, you are well on your way to repairing damage caused by water in your home. 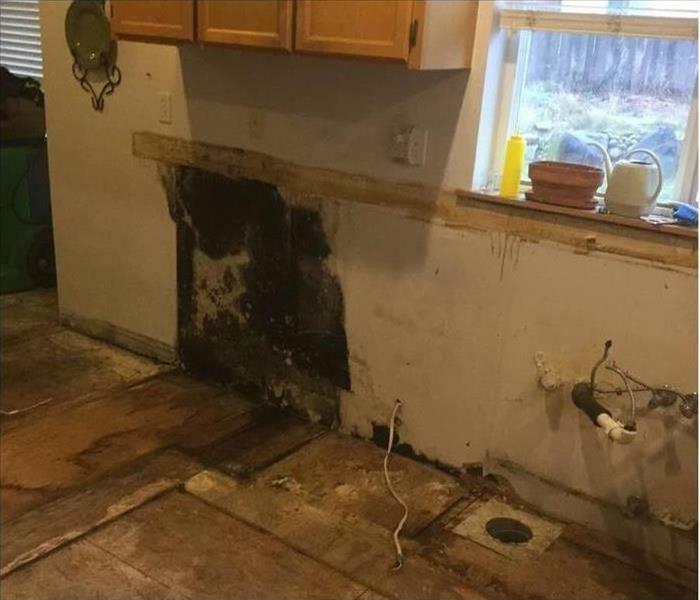 Taking action to minimize the damage from flooding and using professional services can help you get your kitchen back. Beginning with an initial mold inspection can give you a good idea of what needs to be done in your home. 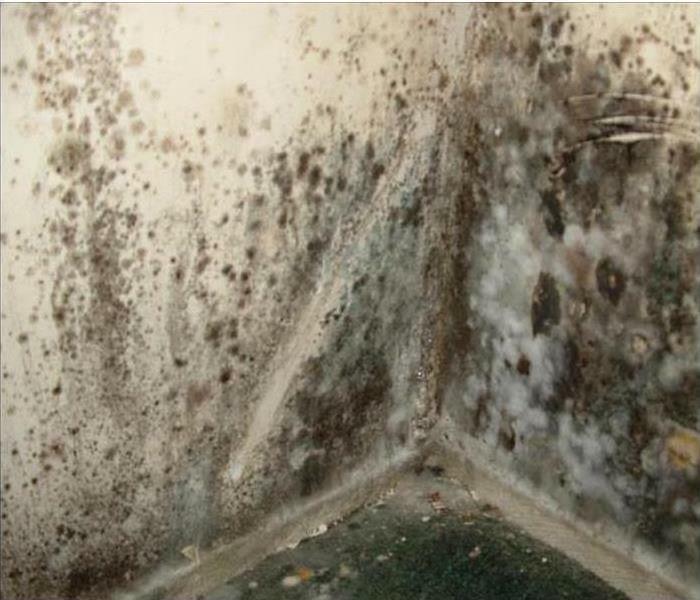 Whether it’s a roof leak, excess condensation, or an old basement, there are many ways mold can spread in your house. If you suspect that mold or mildew resides in your home in Lacey, WA it’s probably time for a mold inspection. Here are a few actions you can take to effectively take care of any mold problem. If you find any of these signs, it’s time to call the professionals. Mold inspection specialists can determine if there is a problem in your home, and they can start the remediation process as soon as possible. House mold can’t always be prevented, but there are many precautions you can take as a homeowner. A couple of things you can do immediately is to clean up any standing water and keep the fan on while taking a shower. If mold is already a problem in your home, you can do your best to contain the growth. You can do this by keeping humidity temperatures down and turning off your home’s HVAC. Airflow can increase the chance of airborne spores spreading to other parts of your home. Once the restoration process begins, mold experts can use professional methods and equipment to eliminate the problem. The remediation process can leave your home completely spore-free. Beginning with an initial mold inspection can give you a good idea of what needs to be done in your home. Depending on the season, your home may be at a heightened risk of a leak during your vacation. There are a few simple steps you can take to prepare your home in Olympia, WA, for your vacation. 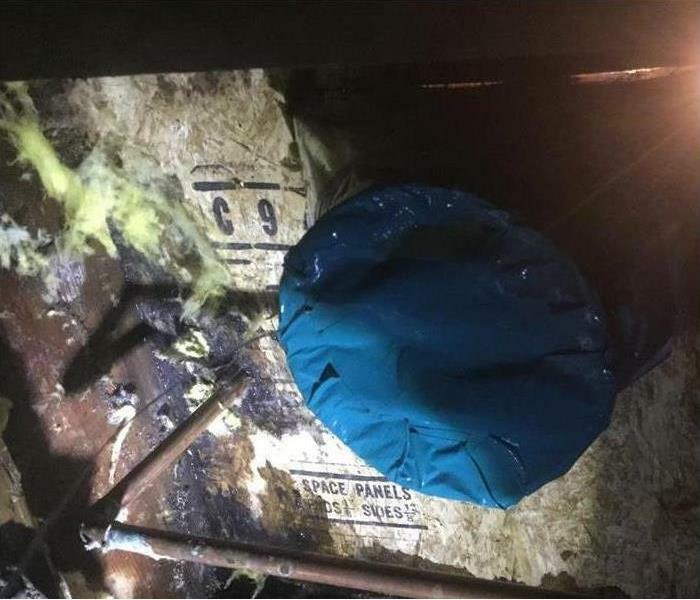 You don't want to return to find your home flooded as a result of a broken pipe or leaky appliance and have to make water pipe repair your top priority. Here are four steps you should take before you depart to make sure your home will stay dry for the duration of your vacation. 1. Shut off the main water valve. Whether you are leaving overnight or on a longer excursion, turning off the flow of water to your home is the easiest way to make sure major water damage does not occur. This is an important step toward preventing the need for water pipe repair. 2. Turn off appliance supply valves. Prevent appliances from leaking by shutting off the flow of water. Many appliance leaks are caused by hose failures, and this reduces or eliminates the amount of water available to leak. 3. Check the sump pump. Test the sump pump system in your basement before you leave on vacation in case a heavy rain occurs while you are away. 4. Clean the gutters. 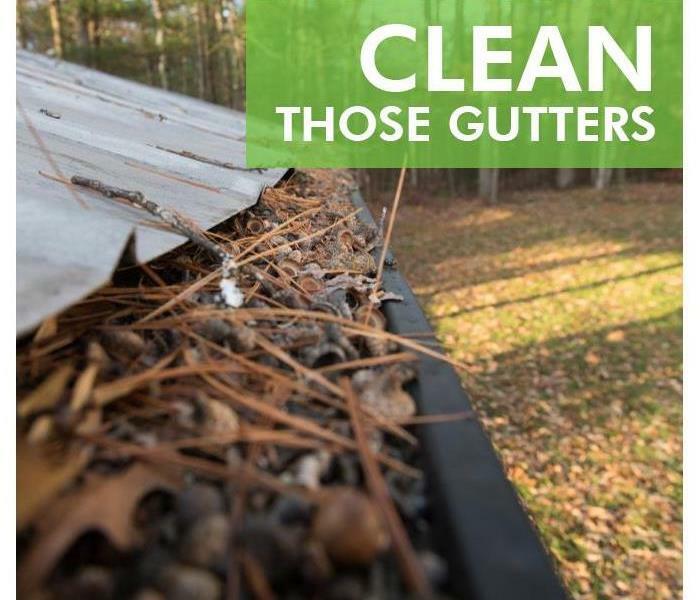 You should also make sure your gutters are clear to prevent water from pooling near your foundation or working its way up under shingles and causing leaks. These steps can prevent a broken pipe from causing problems when you are too far away to see that your home is getting flooded. Rather than risking leaks and the need for water pipe repair after your getaway, you should plan ahead to keep your home in Olypmia, WA, dry while you are away. If a leak does occur, a residential restoration service should be able to provide water damage repair. For more information, please visit us at http://www.SERVPROlacey.com. As a conscientious homeowner, you do everything you can to create a safe place to live. Your best efforts can’t control every situation, however. If trouble occurs, and you experience severe damage and destruction from a storm at your Olympia, WA, house, there’s hope for disaster recovery. One call to SERVPRO will bring a team of capable, committed professionals to support you in cleanup, repair, and restoration work. A quick online search will show you multiple options when you need a crew to assist with storm damage repair and relief. Not all companies are equal, but it shouldn’t take you long to see why SERVPRO is in a category of its own. SERVPRO has support from the corporate office. SERVPRO responds and works quickly. SERVPRO has experience and skill. 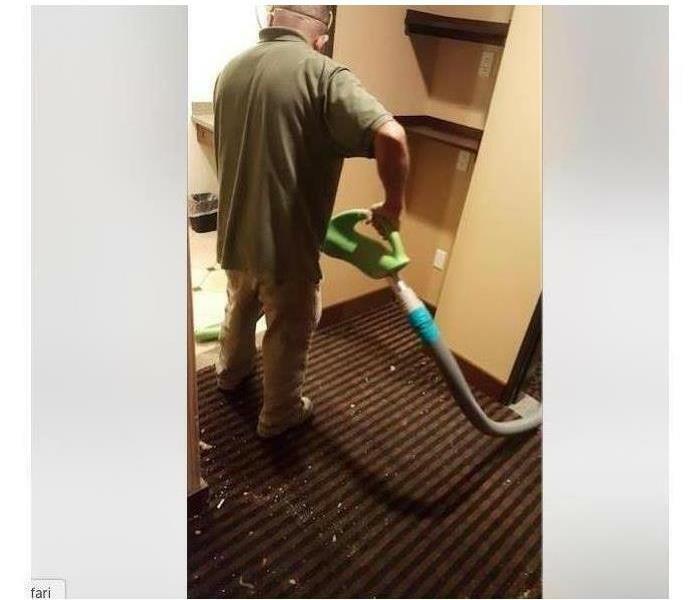 SERVPRO uses the latest equipment and techniques. SERVPRO is a nationwide disaster recovery company you can trust. It has a main corporate office with a strong structure and solid foundation. The company has an office near you as well. This means if you need immediate help following a storm, you can count on a SERVPRO team of experts to come quickly and begin assessing the damage in your home. Following large-scale storms, the local franchise can call upon the corporate office for additional tools and equipment to combat the task. SERVPRO trains its staff with the most proven industry standards and techniques. Employees are prepared to make proper assessments and to thoroughly tear out, clean up, sanitize and restore the affected areas. You won’t see anyone using outdated or obsolete equipment. The crew has a fast storm response and will apprise you of the process from start to finish. Disaster recovery is essential following a big storm. 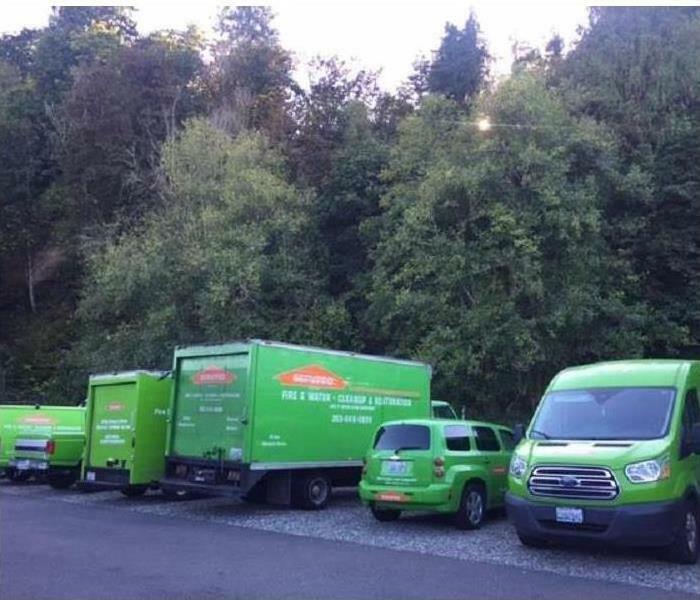 If you want to get your life back to normal, make sure you call the team at SERVPRO. As a business owner in Lacey, WA you know a flood can happen at any time no matter if it’s from severe storms or man-made circumstances such as a water main break. 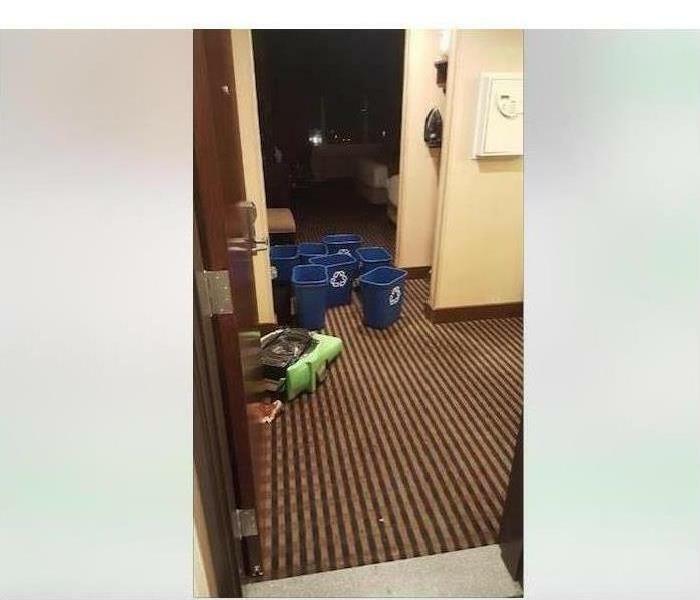 If you experience flooding in your commercial building, you owe it to your employees and customers to start the recovery process as soon as you’re allowed back into the structure. From tear out to reconstruction, here’s what you should expect to happen in the immediate aftermath of a flood. Once the waters start to recede, your storm restoration team can get to work in the affected areas, and the first item of business is the removal of excess water. The longer you allow liquids to stand in your building, the more likely it becomes that harmful bacteria will begin to develop. Remediation specialists will use specialized extraction machines to quickly pump standing fluids outside of the structure. It’s important to realize water damage can often extend much further than what’s visible with the naked eye, which is why it’s better to exercise an abundance of caution. It might seem like an expensive and inconvenient proposition to replace building components that look fine, but it’s much better than learning about the presence of mold in the future. Once crews tear out the affected materials, the only thing left to do is thoroughly dry the area and begin the reconstruction process. If everything goes according to plan, you won’t be able to tell a flood ever occurred. The aftermath of storm damage can be overwhelming, but the most important thing you can do is work with an experienced remediation contractor, as any delays could create significant losses for your business. Visit http://www.SERVPROlacey.com for more information on water damage. Water pipe repair and flooded homes are difficult to deal with at any time of the year, but flooding issues can be exponentially costlier when you are on vacation if the water sits for an extended period of time before you discover it. For peace of mind while you are away, be sure that you take the following precautionary measures to ensure that no preventable water catastrophes happen in your home. This may seem counterintuitive, but keeping your AC on a higher temperature in summertime (or a lower temperature in wintertime) can prevent unnecessary condensation or pipe freezing. If your thermostat is programmable, set it to stay at a manageable temperature while you’re away. Turning off the main water supply is perhaps the most important step to ensuring that you won’t have to deal with needless water pipe repair issues upon your return. If you have someone watch your home or your pets while you’re away, you can simply turn off pipe lines that lead to your appliances. Make sure your sump pump is in working order by pouring water into it. If it’s working properly, this should trigger the sump pump to turn on. 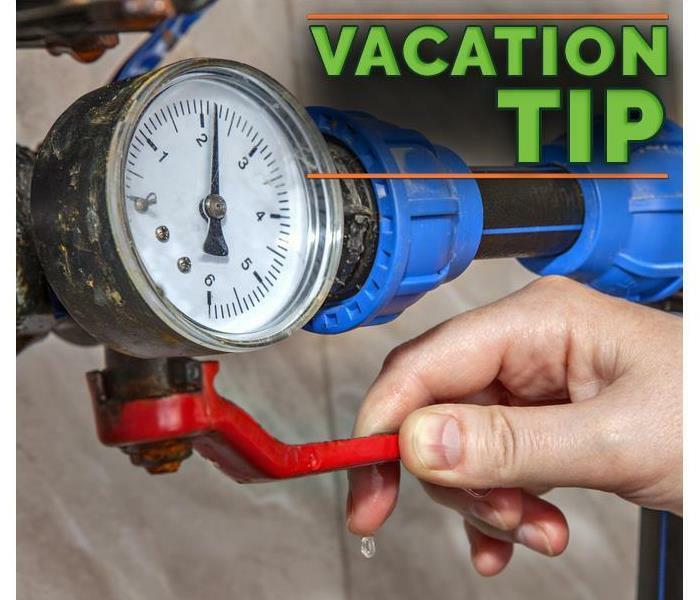 If the pump is not working correctly, you’ll want to see about repairing it before you leave on vacation, to avoid further damages. Plastic lines break easily, so be sure to check supply lines and swap out any plastic lines with stainless steel lines. Stainless steel lines are inexpensive, so it’s well worth the small investment. While you are preparing to leave on vacation, if you find that you already need to repair a broken pipe or locate a water leak, be sure to phone your local residential water damage specialists in Olympia, WA to fix the problem. By settling all your water pipe repair concerns ahead of time, you can enjoy a relaxing, stress-free vacation. Visit http://www.SERVPROlacey.com for more information on water damage. 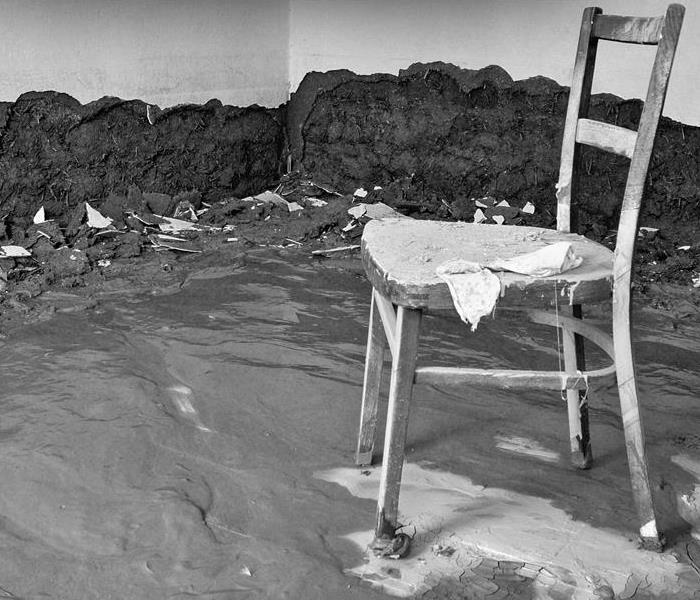 4 Steps You Can Take To Minimize Flood Damage. Before: Establish a clear emergency plan that indicates where employees should go in case of flooding. Additionally, prepare designated shelters and emergency provisions. During: In the case of flash floods, immediately turn off building power and do not allow workers to attempt to swim, drive or walk through the rushing floodwaters. After: Do not require employees to return to work immediately. Contact specialists to ensure your property is clean and secure first. Regularly back up financial data to a cloud-based platform. Keep tax data safe in more than one location. Safely secure client contact data and unfulfilled purchase orders. In Lacey, WA it’s imperative to keep your building’s insurance policy up-to-date, including flood damage provisions. If building elevation increases water damage risks, structural changes, such as fitting water pipes with non-return valves, may help. Don’t rush back to your business as soon as floodwaters have subsided. This may expose you to health dangers from black water or weakened structures. To stay safe, contact a trustworthy storm damage restoration company that can clean up any harmful residuals completely. By taking steps ahead of time to prevent damage from flooding, and by calling cleanup experts immediately afterwards, you can adapt to disasters and resume business operations as quickly as possible. 2/19/2019 - Does Your Home Have A Mold Problem?